by Naheedy, John H., Lim, Susie, Orringer, Daniel A.
Naheedy, John H., Lim, Susie, Orringer, Daniel A. 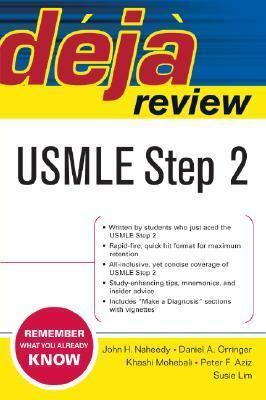 Get the competitive edge you need for the USMLE with the new Deja Review review method. Developed by McGraw-Hill, a leader in medical education and authors, Naheedy, Orringer, Mohebali, Aziz, and Lim, the Think Fast technique is guaranteed to help you with last-minute retention of key facts right before the exam.Why the Deja Review method?With Deja Review's 2-column format, questions and answers appear side-by-side, making self-testing quick and easy. Simply cover the answers to test yourself or leave answers exposed to absorb information right before the exam. Here are just some of the elements that make Deja Review a method of success:Visual learning format 2-column format with side-by-side questions and answers Tools that pinpoint weak spots quickly High-Yield USMLE essentials are covered Authoritative content is developed by recent test-takers and McGraw-HillWith Deja Review, memory retention is number 1 and no other medical review offers the last-minute study tools you need to cram right before the exam.Visit: accessmedbooks.comNaheedy, John H. is the author of 'Deja Review USMLE Step 2 Essentials', published 2005 under ISBN 9780071448765 and ISBN 0071448764. Loading marketplace prices 9 copies from $0.30 How does the rental process work?